While it may not be electronically themed, the mnemonic definitely makes it easier to memorize the resistor color codes. One thing to keep in mind is that the mnemonic applies only to the first few bands of the resistors, the last two bands are always the multiplier (2nd to last) and tolerance (last). Make sure to use the image above to determine what colors correspond to which values and not to rely on the mnemonic. 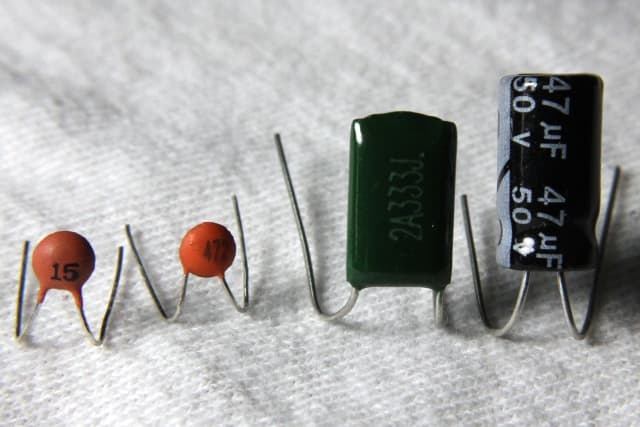 We hope this article cleared up some resistor confusion for you. If you are still confused or just don't want to bother learning the mnemonic, you can always check out one of our Resist Confusion Products. It may seem like cheating but with one of our products on your workbench, you will always have a resistor code handy. Resistors are what are called “Passive Devices”, that is they contain no source of power or amplification. They merely attenuate or reduce the current and voltage passing through them. This attenuation results in electrical energy being lost in the form of heat as the resistor impedes the flow of electrons through it. The symbol commonly used in schematic and electrical drawings for a Resistor can either be a “zig-zag” type line or a rectangular box. There are a large variety of fixed and variable resistor types with different construction styles available for each group. In order to stay on topic we will keep the resistor type section very short. Carbon Resistors are the most common type of Composition Resistors. Carbon resistors are an affordable general purpose resistor used in electrical systems and circuits. Their resistive element is manufactured from a mixture of finely ground carbon dust or graphite (similar to pencil lead) and a non-conducting ceramic (clay) powder to bind it all together. The Carbon Composite Resistor is a low to medium type power resistor which has a low inductance making them ideal for high frequency applications but they can also suffer from noise and stability when hot. Carbon composite resistors are generally prefixed with a “CR” notation (eg, CR10kΩ ) and are available in E6 ( ± 20% tolerance (accuracy) ), E12 ( ± 10% tolerance) and E24 ( ± 5% tolerance) packages with power ratings from 0.250 or 1/4 of a Watt up to 5 Watts. Another type of resistor called a Wirewound Resistor, is made by winding a thin metal alloy wire (Nichrome) or similar wire onto an insulating ceramic former in the form of a spiral helix similar to the film resistor above. Wirewound resistor types are prefixed with a “WH” or “W” notation (eg WH10Ω) and are available in the WH aluminium clad package (±1%, ±2%, ±5% and ±10% tolerance) or the W vitreous enamelled package (±1%, ±2% and ±5% tolerance) with power ratings from 1W to 300W or more. There are many types of resistors not included in this article, along with many applications for them. Since we will be going over the different types of capacitors as we continue on our electronic code blog, we thought it necessary to include a brief description of resistors as well. It'd be fine if components had each spec directly on them when putting together a circuit. However, the truth is there is not enough room to display this info in English. Some might not recognize that capacitors have their own style of markings much like resistors. While most electrical engineers understand the significance of these markings, it's important to educate those who do not. This guide will explore precisely what these markings mean on numerous capacitors styles. As you may or may not know, a capacitor is a device that can store a charge, acting as a short-term battery that can balance power changes, facilitate pulsed frequencies, and perform a variety of other tasks in a circuit. They come in a verity of sizes from a coke can to a grain of sand, so both the characteristics of capacitors and the ability to print information on them vary greatly. 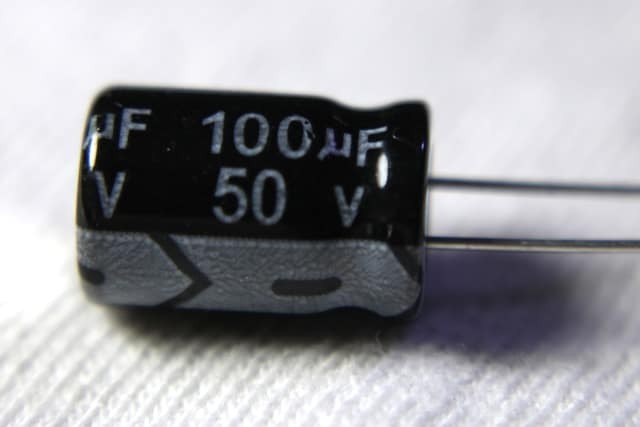 The image above is of an electrolytic capacitor marked with “100μF,” meaning it has a capacitance of 100 microfarads (the μ prefix indicates 10−6). Expressed differently, this is 0.0001 farads. While this might seem like an incredibly small number, it’s actually quite common, as an entire farad is a lot of energy in practical terms. This specific electrolytic capacitor is also marked “50 v,” which indicates its breakdown voltage. It's a warning that the capacitor breaks down at 50 volts maximum. Finally, the white stripe indicates this capacitor is polarized. It has a negative leg which is generally also the shorter leg, as well as a positive leg. The image above shows a Mylar film capacitor. 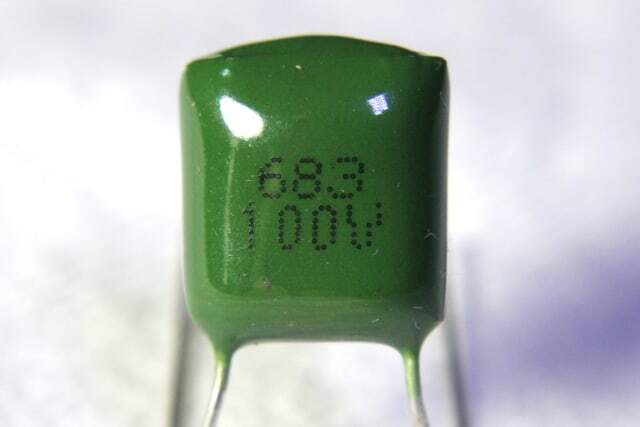 The top “683” marking indicates the capacitance value is 68,000 picofarads (pF). To get this value, you multiply the leading digits (68 in this case) by 10 raised to the power of the last digit (3), and the result is the capacitance in picofarads (in this case, we get 68x103­ pF). There are three exceptions for the last digit: 7 is not used, 8 means to multiply the leading digits by 0.01, and 9 means to multiply the leading digits by 0.1. 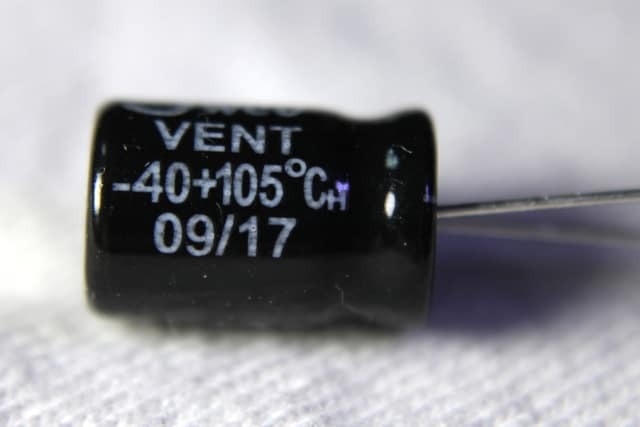 The dielectric breakdown voltage of this particular capacitor is written underneath the capacitance as “100V,” meaning it is likely to fail above 100 volts. This type of capacitor is non-polarized, which means it doesn't have a negative and positive leg. The image above illustrates a pair of ceramic disk capacitors labeled only as “10” and “15.” These capacitors (and all those under 1000pF) directly show their capacitance in picofarads. 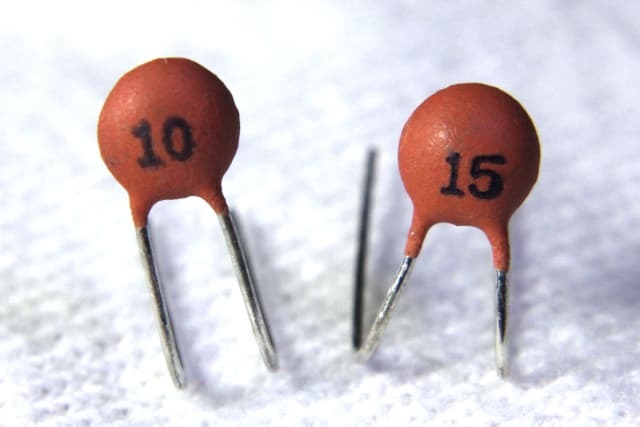 Therefore, the capacitance of these two capacitors is 10 and 15 picofarads. As in the previous case, these capacitors also have no polarity to display. Because of their small size, there are no markings for the dielectric breakdown voltage. This is one instance where you’ll need to look it up on the capacitor’s spec sheet. An addition to the above examples, capacitors may also be labeled with other text such as working temperature range, date of manufacture, and even the manufacturer’s name. Indications may also be seen for a capacitors tolerance range. This is usually done with a letter placed after the first three numbers. These letters range from A (±0.05pF) to Z (-20 to 80%). The table below explains more of these tolerance ranges. If you’re in need of capacitors for a new circuit design, a datasheet is always best to reference. However, with these guidelines, you should be able to identify a capacitor’s basic characteristics. This helps you to use what you have in your component inventory or recycle some from old electronic circuit boards. A note of caution: Capacitors can carry a charge even if the circuit is disconnected, so use extreme caution when handling these devices (especially larger capacitors, as many store a huge amount of charge). They also exhibit an effect called dielectric relaxation, which means they can slowly re-charge when not in use. On large capacitors, it's good practice to connect the two leads in a dead short when not in use to avoid electric shocks. Remember to always think before your touch electrical systems and stay safe SciTech Family.